DHAKA, May 27, 2018 (BSS) - The government has decided to take all possible security measures to ensure security for peaceful celebration of the holy Eid-ul-Fitr across the country. "The entire country would be brought under stringent security measures, including all Eid congregations and Shopping malls in the capital city as elsewhere in the country," Home Minister Asaduzzaman Khan Kamal told newsmen after a meeting on law and order ahead of the Eid in his ministry's conference room here. He said special security measures would be taken for the Jatiya Eidgah and Sholakia Maidan and all large Eid congregations in the big cities, district headquarters and elsewhere in the country. Members of the law enforcement agencies including Rapid Action Battalion (RAB), both in uniform and plain clothes would be deployed for peaceful and smooth celebration of the holy Eid-ul-Fitr, Kamal said. He said the law enforcement agencies have been asked to be active at different strategic points in the cities, including bus terminals, railway stations, river-ports, launch and ferry ghats, to prevent any untoward situation. Several petrol teams would patrol the big cities exit and entry points to ensure smooth movement of motor vehicles during the Eid period and maintain law and order, the minister said. He added law enforcers particularly highway police alongside the RAB would monitor on the highways for safe and sound journey of homebound people. The law enforcing agencies will remain vigilant to check crimes in the capital. The CCTV cameras would install at different points before, during and after the Eid, Kamal said. Replying to a question, he said abuse of drugs would be eliminated from the country like the militant's activities, adding, "The drive against drug abuse would be continued." "All-out arrangements, including temporary control rooms, watch towers and CCTV cameras will be ensured ahead of the Eid. Special security check-posts will be installed at all entry and exit points to and from Dhaka centering the Eid-ul-Fitr. 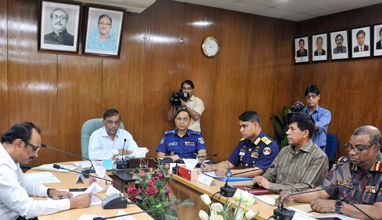 Representatives of different law enforcement agencies including Police, Border Guard Bangladesh (BGB), Bangladesh Coast Guard, Bangladesh Ansar and VDP, RAB, Dhaka Metropolitan Police (DMP) and other ministry officials joined the meeting.